If you have a big family, then you have a big grocery bill. Figuring out how to feed half a dozen or more people every single day without breaking the bank can be a huge challenge. The folks at Big Family Homestead are very familiar with this challenge. 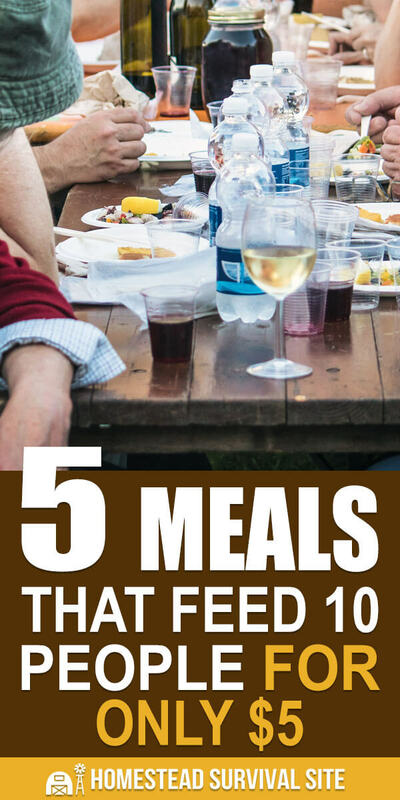 Over the years they’ve come up with several meals that can feed about ten people, and each meal only costs five dollars or less. And we’re not talking plain ole beans and rice. These are meals that even the kids like. Watch the video below for some more details on preparing these meals. This is a great bit on remembering the inexpensive dishes that feed crowds. But I think the price points need to be updated–a dozen eggs hasn’t cost $1.25 for some time! Yeah, and a loaf of any bread hasn’t cost 40 cents in like forever. Unless it’s 40cents a slice. LOL I use a pound of spaghetti just to feed 3 kids and 2 adults. No way 2lbs are going to feed 10 in this house.